November 30th, 2015 Why Not A Rerun? I'm opting for more rest tonight. So it's basically a Tweets only as far as anything new. BUT--I thought, instead of a Tweets only, why not a rerun? Maybe you remember the following episode, uh--I mean, blog post. The following post accurately describes what came together for this turnaround from relapse/regain. How in the world could I do an about-face, a 180--a total turnaround from where I found myself sixteen months ago? The answer isn't a simple sentence or source. It's a bunch of things working together on several different levels. Spiritual, emotional and mental work, and different levels of support--from group support to one on one support, to the accountability measures put into place to help guide me along--keeping my awareness level high and my routine consistent. This turnaround from relapse/regain wasn't a simple declaration of "starting tomorrow things will be different." I tried that approach several times without a shred of success. I wasn't creating an action plan and then, when things remained the same the next day, I'd sit around feeling hopeless and doomed. It was like throwing the same thing against a wall and hoping it would somehow stick this time. It didn't, several times. Honestly, the list felt a little overwhelming, at first. The very first thing I did was try to figure out reasons why it wasn't possible for me to do this thing. The abstinence from refined sugar has made a profound impact bio-chemically--effectively turning off the "binge switch" and ushering in a peace and calm I never knew. But as I've discussed before--it doesn't stop the other side of things--the deeply ingrained pattern of seeking comfort with food in times of extreme emotion and high stress. I've had three very close calls in the last fifteen plus months--one of those three happened recently, on Wednesday July 15th. Each time, reaching out for support--texting it or talking it out, has made a HUGE difference. This here thing, is a daily practice--a one day at a time practice of uniquely crafted fundamental elements. I just want one more day feeling as good as I feel when I'm honoring my commitment and maintaining the integrity of my plan. I'd like a whole bunch of one more days. It's over four months later. I'm approaching 600 days of abstinence from refined sugar. I'm now into weight maintenance mode and I'm still treating all of the above described elements of this turnaround from relapse/regain with an importance level in the highest, most non-negotiable way. Mom and I visited with my aunt and uncle from Michigan this afternoon/evening. It was a very nice visit. These are loved ones we would only see for a week or two every year, all of my years growing up. And as my weight became a bigger and bigger concern for me and those close to me, I remember them expressing worry. Always wanting to put a big nice bow on everything--even if it turned out to be an empty box, I would end their annual visits with the proclamation, "next year you won't even recognize me." And every year after, I would be as big or bigger. And at the end of their next visit, I would say the same thing. I'm not sure if I'm capable of expressing how good it feels to walk into the room at my healthiest weight, have a good visit and reminisce about those days so long ago. It's not about seeking approval or reveling in the "look at yous" and the "wow, you look great" type compliments. I'm more secure in my skin than any other time in my life. I no longer need those to feel good about myself. This turnaround from relapse/regain has provided so many gifts in perspective. The relapse/regain experience itself was a gift. I declared today a rest day. That wasn't the plan. I allowed the time to get away from me. I indulged in the visit. It was worth the time. I had a great cardio/weight training workout yesterday and I'll have another workout tomorrow. I prepared some really good food today and enjoyed an early dinner out with everyone at the place mom and I frequent. I'm hitting the pillow feeling great about a solid Thanksgiving weekend. I have so much to be thankful for in my life. I'm blessed beyond measure. And grateful. Very grateful. Every once in a while I feature another blogger in these pages. Kathleen's story and blog are exceptional. She's exceptional. Kathy is on her quest to lose over 300 pounds and she's currently over a third of the way to her healthiest weight. I know from experience, writing an open and honest account of this process can leave us feeling extremely vulnerable, almost too much at times. But in allowing ourselves to open up despite the vulnerability, we stand the greatest chance of experiencing life changing epiphanies. Some of these epiphanies can be powerful enough to change our perspective forevermore. Kathleen's brave determination and willingness to go deep into the emotional/psychological elements many of us face along the way, coupled with her talents in navigating, dissecting and communicating the process--equals one of the most inspirational weight loss blogs you'll find. Rather than me telling you more about her story, I'll let her writing inform you. It'll do that. It'll also, very likely, inspire you. I sometimes get emotional when I read her blog because it takes me back to some of the very deep explorations I took along the way. We all have different circumstances, for certain-and we all have unique challenges. Still, it's fascinating to me how when we decide to cut through everything imprisoning us and once and for all we decide to choose change in pursuit of our freedom, suddenly we discover powerful commonalities in the process. Please read Kathy's "Life Is Hard" post. You'll find everything she's written in her archives, listed along the right hand side of her blog page. The further I proceed into maintenance the more I realize how similar what I do today is to what I was doing in weight loss mode. I mentioned this several times during the turnaround from relapse/regain. From nine months ago: "Several have asked me if I'm thinking about my plan for maintenance mode. Honestly, it will look very similar to what I'm doing now, just more calories and different workouts, perhaps." If the goal is to find a plan and groove that works for you in weight loss, I feel like the secondary goal of it being something you can do, with very slight modifications, forever, is key. I think this is a great question--a common one, actually-- "Is this something I can do for the rest of my life?" For me, my elements of recovery--the ones that have worked so well for me, are ones I hope and pray I never stop doing. The accountability Tweets and the pictures required, weighing and measuring food, abstinence from refined sugar, the logging of everything in MyFitnessPal, the connection to a solid support team--these are things I do. This is my normal. I embrace these things and they've become a critical part of me. Every now and then, out in public--or around someone who isn't familiar with what I do, I'll feel a twinge of they probably think I'm abnormal--different--strange--obsessive or whatever else they might think of someone who photographs and tweets every glass of water while sitting at the sports bar watching a game... But then I reassure myself that it doesn't matter what anyone else thinks. What they think is none of my business. It's okay. I'm okay. This is me. I'm proudly doing what I do for incredibly important reasons. I don't have to explain it or defend it to anyone, ever. I do not have a lock on this, nor will I make that claim. Because I know the truth--If I ever decide to no longer do what I do, I will relapse and regain. The elements of my recovery are given the highest level of importance because anything less will not work for me. Less could work perfectly for someone else, but not me. So, if you ever look at me as someone who has weight loss and maintenance figured out and under control, please remember, first of all--I don't. Then, please remember to give the credit for what I do have to the structure and support of the plan, not me. Because if we stripped away the spiritual, emotional, psychological and fundamental elements of my recovery, I'd be a 500 pound man again, in record time. I took extraordinary care today. The Tweets can give you the tour. I prepared some good food, nailed a wonderful workout, exceeded my water goal, maintained some wonderful support connections/interactions and watched some of the trouncing my Oklahoma State Cowboys took from the Sooners. A 10-2 season is an awesome season. Some friends of mine suggested the Cowboys will likely play in the Alamo Bowl. That's a decent bowl. I'm happy, regardless. Weighted step ups ✔️ Jumping Squats ✔️ Overhead press ✔️ Mod.Push-ups ✔️ Lunges ✔️ Reverse lunges ✔️ Focusing on tightening core during all. I made today a rest day all the way around. I took a nap. I prepared some good food. I spent the entire day at home, just taking it easy. I need a day like this every now and again. I did get out tonight to enjoy a meal at my favorite Mexican restaurant. I call 'em "potato nachos." Sliced red potato, baked w/olive oil spray at 400deg., flip after 10, another 10-then top w/whatever! I don't want to waste good food. So I keep it in the fridge until it goes bad. Then I don't feel horrible about throwing it out. The changing of the seasons from summer to fall was always a popular time for me to start weight loss attempts. Thanksgiving was never far away and it almost always signaled the beginning of the end. The only time it didn't stop my efforts cold, was when I started losing weight in the fall of 2008. My approach to that Thanksgiving was structured with a plan. I fully believed if I could maintain the integrity of that plan I could accomplish two things: I could enjoy Thanksgiving and stay on track beyond the special day. I made my plan important. I made me important. And for once in my life, Thanksgiving didn't signal the beginning of the end, it was the beginning of a new weight loss perspective. Today marked my 8th Thanksgiving along this transformation road and the 2nd since starting recovery from relapse/regain. As in years past, I had a plan and a set of non-negotiable elements ready to go. I allowed for an extra 300 calories in my budget. From there, I vowed to maintain the integrity of my Thanksgiving calorie budget, I vowed to remain abstinence from refined sugar, and I vowed to get a brisk 5K walk in before the end of the day. These were non-negotiable elements. I'm happy to report, I honored my commitment today. And it was fantastic. I didn't use a single calorie of the extra 300 I allowed. It just wasn't necessary. I'm fortunate to be in maintenance mode and my 2300 calorie daily budget works very well for my obviously repaired metabolism. I stayed connected with support buddies throughout the day and that always strengthens my resolve. I indulged in conversation, in taking pictures, in giving hugs and catching up with loved ones. I focused on gratitude, giving thanks for my many blessings and expressing to people how much I appreciate them. It was a great day because my focus wasn't fixed on the buffet line. My focus was right where it needed to be in order for me to have the most wonderful day possible. I skipped the sugar free rolls and sugar free desserts this year. Those sugar free items were kind of novelty to me last year. This year, I just didn't find it appealing in the least. Whatever is used in making the sugar free items work, upsets my stomach. Remaining abstinent from refined sugar gives me a peace and clarity I never before experienced. And from this more stable place, I'm able to make better decisions within my plan. I didn't take any of the leftovers home. I let others handle the removal of excess food. Besides, I'm horrible with leftovers. I just threw out an entire pot of veggie beef soup. I'm not big on soups, I guess. My original plan included an outdoor 5K today, but the weather didn't cooperate. I took it indoors at the gym and onto a treadmill. I did the treadmill 5K, then headed for the studio to get a few things done. I'm about to drop. I'll be sleeping in tomorrow. It'll be refreshing. Happy Thanksgiving! I'm loading up on extra portions of gratitude today. It will be a great day! All items verified sugar free! :) That will hold me for a long while! Visiting with family. Loving this. He won with a TKO when I ran out of energy. Sure, I would have preferred a slight down tick or perhaps the same on the scale today. But really, that's asking a lot. The numbers from the past four maintenance weigh-ins suggest a balancing act. It doesn't feel like that at all. I'm just doing what I do. I'm eating well and at a level for maintenance, not weight loss. The .8 gain this morning is not a huge concern. It's reflective of a continued commitment to the fundamental elements bringing me this far. 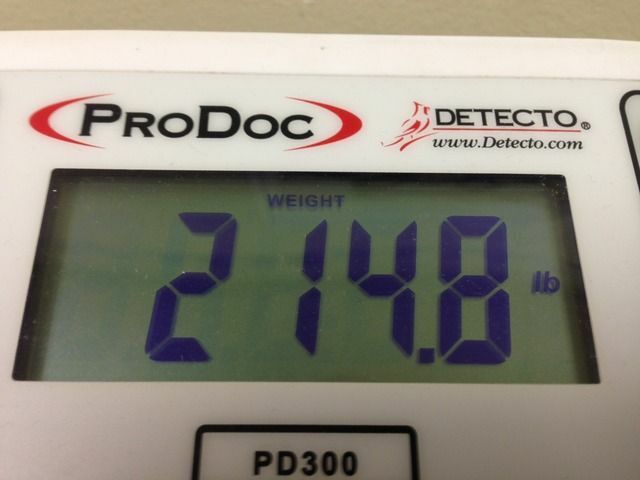 But this is two .8 pound gains in a row!! Sure, it is...but remember what I'm capable of gaining if I were to strip away all of what I make important each day. This number represents a comfortable range. 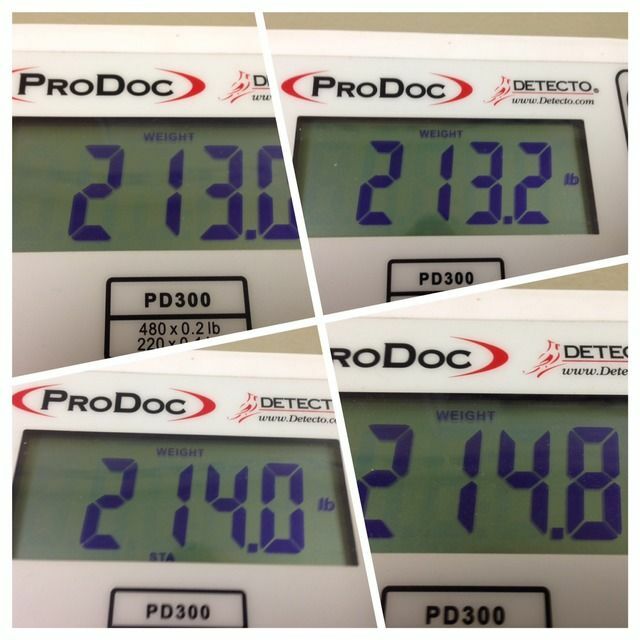 The last four maintenance weigh-ins show a 1.8 pound overall gain. I'm catching it at the uptick times--because knowing how our bodies naturally fluctuate, I'm sure there's a low in there somewhere, I'm just not catching it on that morning. I suppose if I was a daily weigher, I'd know. Every two weeks works for me. I'm not changing that. And I'm not changing anything I'm doing, other than changing my workout routines and frequency. The food plan--boundaries, non-negotiable elements--those remain the same. I'm ready for a good Thanksgiving. Tomorrow will be a day filled with gratitude, visiting with family and enjoying a really good meal. Rather than adding 1,000 calories to my budget as in years past, I'm only adding 300 tomorrow. 2600 should work well. I enjoyed Thanksgiving last year and finished the day at 1,960, so 2600 is ample room. I may not even use that--it depends. My abstinence from refined sugar makes it much more doable to stick a lower count. The main thing for me tomorrow will be maintaining the integrity of my plan as I do each and every day. I will log everything, tweet everything, all day--I will exercise well, likely a 5K in the park and I will remain in contact with friends in support. I'm excited about tomorrow for all the good reasons. Today was busy, punctuated with a midday location broadcast. It was late when I made it back home--after 4:30pm, and I immediately grabbed a nap. I had been looking forward to this nap all day. I'm off work from radio tomorrow. I plan on sleeping in some, then cooking throughout the morning before heading to the lodge across town where we're all (bunch of family!) getting together. My workout tonight was better. After admitting to the trainer my less than all effort when I'm alone, I intentionally tried a little harder. It worked well, although it doesn't seem to be as intense, still. It was an improvement. Progress beats perfection. Consistency beats intensity. I'm going for consistent progress. I'll likely not eat sweet potatoes for Thanksgiving. All in how it's prepared, for me. Treadmill warmup- Push-ups, tricep extensions, weighted step ups, jumping squats, overhead press. Okay-- that's all tonight! It's late. I had a special event commitment this evening that kept me out later than expected. I prepared myself by bringing necessary materials needed for me to successfully participate in the Tuesday night support group from a remote location. I also prepared by packing some almonds, cheese and a banana to hold me over until a late dinner. My dinner wasn't as late as the Tweet suggests, below. I started about an hour before the time stamp on the Tweet, still--it was a very late dinner. Today's schedule required me to reschedule my appointment with the trainer. I did that and had a very nice conversation with her about what I will do between now and our next session. My admission to her was how I clearly get a better workout when she's there. Alone, I naturally don't push as hard. I must dig a little deeper into this exploration of my nature (very common thing) because our sessions are nearing the end very soon. And my progress/results will be on the level of my commitment and consistency. I've learned this with weight loss. The weight training and increased overall fitness is an important focus for me. I'm exploring accountability measures I can institute to help me give it my all, every time. Tomorrow is my bi-weekly maintenance weigh-in day at the doctor's office. It'll be a busy day spent preparing to be off for four days straight. Oh my--I'm looking forward to the time! As we close in on Thanksgiving, I'll be writing a lot about the day, about past experiences and more. In fact, it's the topic of the latest edition of the Winning Loser Video Blog. My memory didn't serve me well during this video or tonight on the support group call. I remembered adding 500 calories to my Thanksgiving budget and only using 230 or 240. 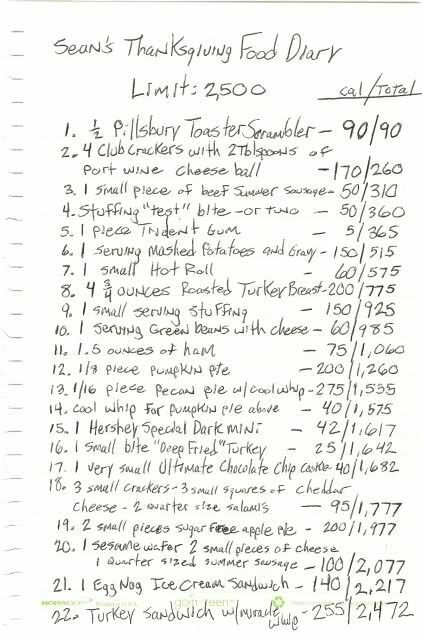 Instead, after review of the 2014 archived blog post--I discovered 1,000 calories was added to the budget that day and I only used 262. Close, well, kind of close, at least. Going all the way back to Thanksgiving 2008, I found my hand written food diary. This was before MyFitnessPal came along! This was also several years before my abstinence from refined sugar. I normally didn't log anything back then, I simply kept a running total in my head. I made an exception for Thanksgiving. I was taking special precautions with Thanksgiving because so many of my weight loss attempts ended right then and there...I was determined it wasn't happening again. Not this time. Today was a great day. It was productive and busy. I managed my food within my plan, we had a wonderful support group teleconference tonight, I enjoyed a great workout, exceeded my water goal and I feel fantastic. I couldn't ask for more. Oh, by the way--one thing I forgot to put in the video. If you're cooking for Thanksgiving, consider chewing sugarless gum to prevent nibbling. It's worked very well for me over the years. I plan on utilizing that particular strategy again this year. I spent a bunch of time doing my best to create the next episode of the Winning Loser Video Blog. I kept having issues. So, I'm calling it a night and I hope to have it uploaded by tomorrow night. That's what I get for stating in a matter of fact fashion, "the next episode will be released tomorrow night!" Not that I think you're waiting on it--I'm just saying, lesson learned. I'll release them along the way without the tease! I shared some thoughts today within the support group I co-facilitate with Life Coach Gerri, about Thanksgiving perspective--which incidentally is the topic of this next video blog episode--, I thought I would share it here, too, before officially calling it a night. The thought starter here was the idea of making Thanksgiving "a free day" with food. The goal, to me, in regard to food--is to redefine the relationship. And these new practices and important perspectives are designed to accompany me in all food situations, including the biggest of all food holidays, Thanksgiving! The concept of a "free day," strongly suggests that what I'm doing any other time is simply a means to an end...in other words, if my plan and perspective is constantly leaving me longing for when I can break "free," going back to my old behaviors, than I must reevaluate my plan and perspective. What we do shouldn't feel like shackles and chains we're desperately wanting to be free of... It's kind of like, "pick your freedom!" Do we want freedom to cut loose, go on a free for all that completely sacrifices our goals and desires and the ultimate freedoms we know exists when we take good care? Or do we want a freedom that affords us so many blessings (the list of blessings/freedoms is too long to list them all---mental-emotional and physical--it's a long list if you think about it)--and still allows us to eat, within certain boundaries? Ultimately, Thanksgiving will be what we make it-- In my experience, if I shift the perspective and embrace the people around me--the opportunity to catch up--the special moments--the making memories---It's then, that I have the most wonderful experience. I never truly enjoyed Thanksgiving in this way before I started losing weight--because I was in a food fog...My focus was on all of the food--and how much I could eat...I hardly noticed or cared about much else around me...and then I would pop some antacid tablets and find a place to sleep it off... It's not too far removed from what has become completely acceptable and expected in our society/world---but for me, a food addict, it's a dangerous thing...it doesn't just sacrifice a more meaningful Thanksgiving experience--for me, it potentially sacrifices everything after...up to and including my very life. Okay--enough of that...now, some practical suggestions: Increase your calorie budget by 700-1,000 calories on Thanksgiving. Yep. Give yourself room--but here's the catch: Log everything, keep your count--maintain those boundaries... Make a walk or some form of exercise important that day... By maintaining the integrity of your modified plan, you should feel a nice measure of certainty... and on a psychological level, that's really important....Also, do you best to shift your focus from the food to the people around you as described above... Focus on gratitude, as the day suggests--giving extra thought and attention to the blessings you enjoy. If you do these things, I'm confident you'll not feel like you're being held against your will, longing for freedom... You'll feel a confidence in your plan and a perspective that is in harmony with your heart's desire--your goals along this road. I spent the evening with mom in Stillwater. We had dinner at our usual place. It's such a blessing to have a wonderful relationship with her. Our sense of humor is very similar, and this results in a lot of laughs whenever we get together. We had a nice drive around town after dinner before I took her back to her place and headed home. It was a very nice evening. I participated in active support communications, online, via phone and in person today. After each, we often exchange a mutual thank you. Because, you see, regardless of who reached out for support, both parties involved benefit from the exchange. I'm grateful for another successful day. November 17th, 2015 Was I Dreaming?